Tight junction proteins maintain the integrity of the epithelium and are critical to its function as a physical barrier. Secreted protective mediators such as antimicrobial peptides and inflammatory mediators form a chemical and immunological barrier against pathogens and toxicants.4 There is a growing need for physiologically relevant models of the respiratory epithelium, but recreating these complex functions in vitro is a considerable challenge. 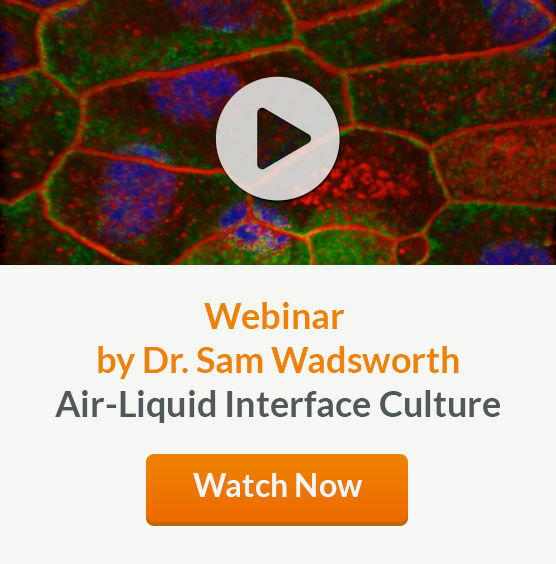 The defining feature of ALI culture is that the basal surface of the cells is in contact with liquid culture medium, whereas the apical surface is exposed to air. A common approach is to seed cells onto the permeable membrane of a cell culture insert, which is initially supplied with culture medium to both the apical and basal compartments (Figure 1A). Once confluence is reached, the cells are subjected to ‘air-lift’, where the medium is supplied only to the basal chamber (Figure 1B). This configuration mimics the conditions found in the human airway and drives differentiation towards a mucociliary phenotype. Schematic of submerged (A) and air-liquid interface (B) culture of primary human bronchial epithelial cells grown using porous culture inserts. ALI culture of primary HBECs is increasingly being recognized as an important culture system that facilitates physiologically relevant respiratory research.5 HBECs cultured at the ALI undergo extensive mucociliary differentiation, resulting in an in vitro model that is representative of the in vivo airway. Hematoxylin and eosin (H&E) and periodic acid-Schiff (PAS) staining show that ALI cultures (Figure 2A and 2C), like the in vivo bronchial epithelium (Figure 2B and 2D), are pseudostratified in morphology and are made up of a heterogeneous cell population, including ciliated and mucus-secreting (PAS-positive) cells. (A-B) Hematoxylin and eosin (H&E) and periodic acid-Schiff (PAS) staining reveals that cells differentiated at the air-liquid interface in PneumaCult™-ALI (A and C) form a pseudostratified epithelium that is representative of the in vivo bronchial epithelium (B and D). Data in (A) and (C) generated by Samuel Wadsworth. PneumaCult™-ALI (Catalog #05001) is a serum- and BPE-free culture medium that has been optimized to reproducibly support improved mucociliary differentiation of primary HBECs in ALI cultures.